Federal quarantine regulations for Phytophthora ramorum are developed by the United States Department of Agriculture – Animal and Plant Health Inspection Service (USDA-APHIS). Additional quarantine regulations are in place in the California counties and partial area of Oregon with wildland infestations. Find more information at the USDA-APHIS P. ramorum page. The California Department of Food and Agriculture (CDFA) implements quarantine policy for California with enforcement conducted by county agriculture departments. See more details on California’s statewide quarantine on the CDFA website. Businesses or individuals with questions concerning movement of host nursery stock, firewood or other materials made from host trees or plants can contact their county agricultural commissioner’s office – see the Contacts page for more information. In California’s wildlands, the Board of Forestry has created a Zone of Infestation for Sudden Oak Death. Review their policies at the Board of Forestry website. See additional information at the Oregon Department of Agriculture website. The National Plant Board is a non-profit organization of the plant pest regulatory agencies of each of the states and Commonwealth of Puerto Rico. Regulations for the shipment of nursery and greenhouse stock for each of the 50 states are available. To prevent further introductions of P. ramorum, the United States regulates importation of nursery stock into the USA. See the April 18, 2012 order from APHIS for more information. For details from other countries, see the Canadian Food Inspection Agency (CFIA), UK Department for Environment, Food and Rural Affairs (DEFRA), and UK Forestry Commission (FC) websites. International standards require pest risk assessments to evaluate the need for quarantines. 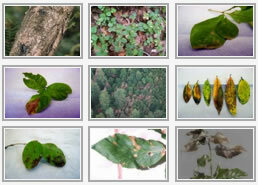 Phytophthora ramorum risk assessments from several countries are available in our Pest Risk Assessments document. * Regulatory information previous to 2012 is stored in our Historical Archive.